MASS TIMES: Saturday 5:15 p.m., Sunday 9:15 a.m. & 11:30 a.m.
We’re glad you found us! Joining a parish is an important decision in a family’s lifetime. It marks a new beginning in one’s faith journey. At St. Anne, our mission is very simple: to foster discipleship – where everyone comes to know, love and serve God and neighbor. This mission is rooted in growing in relationship with our Lord, and bringing the Light of our Lord to others. Sunday: 9:15 a.m. & 11:30 a.m.
We offer a variety of faith formation programs for children preschool through 8th grade. Our desire is to make programs convenient for you – most are scheduled around Mass times to allow you to attend with your family while allowing your children to attend class before or after. The teen years are crucial to the faith formation of young people. Today, so many things are competing for teens’ attention. That is why we offer a variety of programs for teens in 6th through 12th grade. Through formal class time, social activities, retreats, mission trips and conferences, teens connect with their peers and learn about their faith in a relevant way. At this age, we also stress lifelong discipleship – where they come to know, love and serve God and neighbor, and what this means for life-long commitment. Often, the best path to growing in faith and in discipleship is to have a sense of belonging- a small faith group with which you can share experiences, the ups and downs of life, and learn from each other. We have several adult programs that you can take advantage of. Serving comes in many forms. We are called to serve in time, talent or treasure. By serving, we carry out the command to “love God and neighbor.” As you consider how you might serve in the parish, consider your gifts, interests and talents. While a minimum of three hours per month of service is suggested, our biggest hope is that you find a ministry you’re passionate about. We also ask that parishioners give generously, financially. The Sacraments are the lifeblood of our parish, distinguish us as Catholics, and provide the grace needed in this earthly life. According to our catechism, “Sacraments celebrated worthily of faith, confer the grace they signify. They are efficacious because in them Christ himself is at work: it is he who baptizes, he who acts in his sacraments in order to communicate the grace that each sacrifice signifies." 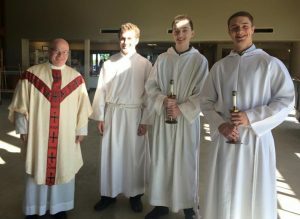 In the Sacrament of Holy Orders, or Ordination, the priest being ordained vows to lead other Catholics by bringing them the Sacraments (especially the Eucharist), by proclaiming the Gospel, and by providing other means to holiness. Have you been called to a special vocation? Information and appointments are available for those who would like more information about vocations for the priesthood or convent. Contact Fr. Bob at the Parish Office, (262) 942-8300 or (262) 331-0906. Watch some videos on a Day in the Life of a Seminarian and a Priest below. View stories about men who discerned a vocation into the Priesthood here.